Hoda Saber, dissident Iranian journalist, died yesterday in Evin prison, ten days after starting his hunger strike in protest at the killing of Haleh Sahabi during her father's funeral. 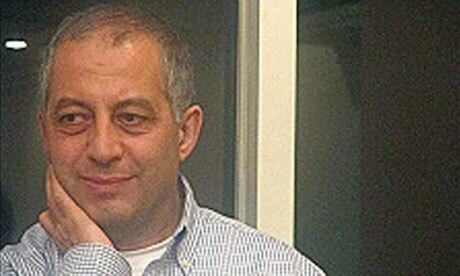 Dissident journalist, Hoda Saber has been jailed numerous times, his current sentence started in August last year. Hoda staged a hunger strike 10 days ago in section 350 of the Evin prison, accepting only water, sugar and salt. His inmate Amir Khosro Delresani, who also joined him on hunger strike, is still continuing with his protest. In 1981, when IRA's Bobby Sands died in the Maze prison after staging a 66 day hunger strike, the Islamic Republic wasted no time to rename a street near the British Embassy to Bobby Sands street. Now it will only be appropriate to rename streets near Islamic Republic embassies as Hoda Saber street. There is of course one difference. Bobby Sands was a member of an armed group which carried out bombings, Hoda was just a journalist. A little nightly spray paint on a street sign near the London embassy would work well..